The hunt for the world’s best startup continued in Buenos Aires last week as The Social Radio won the Buenos Aires semi-final of The Next Web’s global startup competition; Startup World. The Social Radio elevator pitch: “The Social Radio converts Twitter into a radio; Listen to your timeline, lists and trending topics mixed with music. 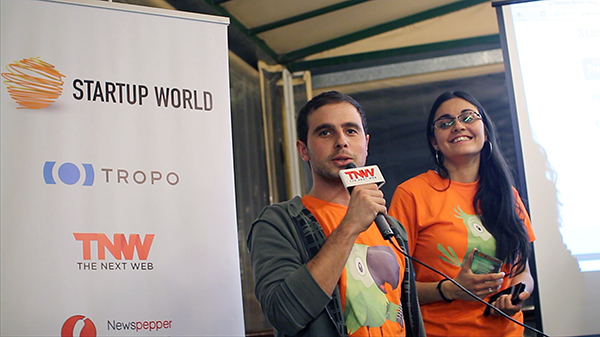 The content you care about with the music you love, anytime.” Founders Roberto Gluck and Alejandra Negrete were pleased with their winnings and will now compete in the grand final against startups worldwide in Silicon Valley in 2013. Over 250 applied to pitch in Latin America and just ten finalists were chosen to pitch at the event held at NXTP labs in Buenos Aires startup district: Palermo. The 10 finalists were Liibook, Shopperception, Urbita, BeTransit, Wideoo, We Love the Ropa, The Social Radio, Mercado Transporte. Judges included Vanesa Kolodziej, Managing Partner – Nazca Ventures , Maca Lara Dillon, Co-founder & Chief Editor en PulsoSocial, Marta Cruz, Co-Founder & Director en NXTPLabs, Ismael Briasco Founder & CEO en PsicoFXP and Martin Vivas, Global Facilitator at Startup Weekend. We would like to thank our on the ground partners Palermo Valley, NXTP Labs and Agu De Marco co-founder of Wideoo for hosting us via Startup Stay.